The new for 2017 Papo Acrocanthosaurus and Papo Ceratosaurus dinosaur models are now in stock at Everything Dinosaur. These two beautiful dinosaur models with articulated lower jaws have just arrived at Everything Dinosaur’s warehouse, ahead of their official release date. This means that we are now stocking five, new 2017 Papo models – all of them dinosaurs. The Papo Acrocanthosaurus and the Papo Ceratosaurus dinosaur models. Papo repainted Velociraptor (blue) with an articulated lower jaw. Papo Acrocanthosaurus dinosaur model, complete with an articulated lower jaw. Papo Ceratosaurus – this replica too, also has an articulated lower jaw. The largest of the Papo models introduced into the dinosaur model range to date is the Papo Acrocanthosaurus. It measures an impressive twenty-eight centimetres long and that sinewy, serpentine tail is nearly sixteen centimetres in the air. It is the biggest Papo prehistoric animal model to be introduced this year. The impressive and toothy-looking Ceratosaurus is very well painted, lots of teeth on show (perhaps the model represents the Ceratosaurus species C. dentisulcatus)? The Papo Ceratosaurus model measures around twenty centimetres in length and not including that large nasal horn, the model stands a fraction under nine centimetres high. The Papo range have great appeal to model collectors and dinosaur fans. The French company has built up a strong reputation in the dinosaur model market. It may be seventeen years since the release of the multi-award winning film “Crouching Tiger, Hidden Dragon”, but today, we draw similarities between one of director’s Ang Lee’s most successful movies and a new scientific paper published in the on line journal “Nature Communications” that illuminates how the crouched posture of modern birds evolved from their more straight-limbed dinosaur ancestors. It’s really a case of “standing dinosaur evolves into crouching bird”. Just like the film released in 2000AD, the research is the culmination of extensive collaboration between China and the West. A joint study between scientists from the Royal Veterinary College, led by Professor John Hutchinson and Professor Baoyu Jiang (Nanjing University, China) and associates have analysed the perfectly preserved soft tissues around the ankle joint of a 125 million-year-old, early bird called Confuciusornis and used this data to work out the evolutionary path the birds took towards their more crouched posture. Known from hundreds of beautifully preserved specimens excavated from Lower Cretaceous strata associated with the Yixian and Jiufotang Formations of Liaoning Province (north-eastern China), Confuciusornis was a pigeon-sized bird that shows a number of anatomical adaptations over more primitive creatures such as Archaeopteryx. For example, Confuciusornis had a toothless beak, compressed caudal vertebrae (pygostyle) and a deeper chest to support more powerful flight muscles. The males possessed a pair of extremely long tail feathers (see illustration above), whilst the females tended to be smaller and lacked long tail feathers. The researchers examined the lower leg of one specimen which had soft tissues preserved, including the remnants of cartilage and ligaments, around the ankle joint. These fossils have been preserved in layers of very finely-grained volcanic ash, enabling exquisite details from animals that lived more than 120 million years ago to be studied. Multiple spectroscopic imaging methods in conjunction with X-ray synchrotron analysis enabled the team to examine these tissues at the molecular level. Some of the bird’s original organic chemistry was identified. In particular, the team found evidence of fragments of the collagen proteins that made up the leg ligaments, which matched the preservation at the microscopic tissue level of detail. The team’s findings concur with an increasing body of evidence that, under certain special conditions, some biological molecules including even amino acids or partial proteins, can persist over millions of years in the fossil record. Confuciusornis micrograph of ankle area showing cells (yellow arrows). The image above shows a cross-sectional slice of the ankle area with a large area of mineralisation (m) visible in the fibrocartilage within the ankle joint. The yellow arrows equate to cells, scale bar 10 μm (microns). Soft tissue preservation in a Confuciusornis fossil. The image above shows a cross-sectional slice of tendon or ligament fibres (arrow) from a scanning electron micrograph of the fossil tissue (scale not stated). The researchers then reconsidered this evidence in light of the whole anatomy of the Confuciusornis leg, and that of its cousins from earlier dinosaurs to extinct and even modern birds. Using this data, the team were able to obtain more information that potentially maps out how the straight-limbed ancestors of birds (Theropod dinosaurs), evolved the crouching gait. A three-dimensional, computer generated image of the lower right leg of Confuciusornis. This multi-technique study involving scientists from both Chinese and British academic institutions, has provided a new insight into the evolution of modern birds. The team have essentially plotted the evolution of the ankles of modern birds from their reptilian ancestors. By comparing the confuciusornithid material with that of later Enantiornithines and those primitive birds believed to be more closely related to modern Aves (Neornithes), such as the Ornithurae, the researchers have shown that as the number of main toes was reduced, the foot narrowed and became more robust. The hypotarsus process became more prominent and enlarged and the orientation of the foot altered towards a more crouching gait. This led on to the development of fibrocartilages, mineralisations and ultimately bony ridges and grooves to enhance the leverage of as well as enclose and guide the foot tendons which are seen in most modern birds today. Everything Dinosaur acknowledges the assistance of a media release from the Royal Veterinary College in the compilation of this article. A number of media outlets have covered details of the new scientific paper published in the “Journal of Vertebrate Palaeontology” that maps the extensive dinosaur tracks located on the Dampier Peninsula of Western Australia. The focus of many of these reports has been on the discovery of giant Sauropod footprints, which at around 1.7 metres long, have been dubbed “the biggest dinosaur footprints in the world”. Biggest Dinosaur Footprint in the World? Richard Hunter lies next to the giant dinosaur footprint. Certainly, the picture of the individual print, with one of the field team, lawman Richard Hunter lying alongside, has captured the public’s imagination. However, some of the key findings of the academic paper have been somewhat overlooked in the mainstream media. In this article, we will briefly summarise some of the main points. The sandstone rocks of the Dampier Peninsula contain a vast amount of very well-preserved dinosaur tracks, prints and trackways. They have been studied periodically since the 1960’s but were and remain, part of the myth culture related to creation for the indigenous people. The sandstones date from the Lower Cretaceous (Valanginian to Barremian faunal stages), that’s around 140 to 125 mya. The date of these rocks in Western Australia equates to around about the same time as the Wealden Supergroup was being formed, strata that is exposed in southern England, including the Isle of Wight and has yielded a wealth of dinosaur fossil material. So, the trackways and prints preserved in Western Australia, permit scientists to compare and contrast the different dinosaur faunas that existed in different parts of the world, this is one of the key points from the mapping of the Australian tracks. In addition, these rocks are much older than the dinosaur fossil bearing strata in other parts of Australia, notably Queensland, the Winton area for example. The trace fossils preserved on the peninsula provide the main record of non-avian dinosaurs in the western half of Australia, this ichnofauna provides the only detailed glimpse of Australia’s Dinosaurian fauna during the first half of the Early Cretaceous. Extensive dinosaur tracks – Sauropodomorpha (Broome sandstone). One of the implications for this study, is that the Sauropod tracks provide scientists with an opportunity to research further how such large browsers and grazers shaped the environment and the ecosystem, just as elephants influence the flora to be found in Africa, where these extant herbivores are located in significant numbers (see photograph above, showing extensive Sauropodomorpha tracks – dinoturbation). The research team, which was led by Dr Steve Salisbury (Queensland University), were invited by the area’s Goolarabooloo Traditional Custodians, to map and document the sacred trackways. From 2011 to 2016, the field team spent hundreds of hours recording, photographing, casting and mapping the trace fossils, a task made extremely difficult by the extent of the trackways and the fact that most of them were only exposed at low tide. Drones were used to provide an aerial view of the footprints, perhaps one of the most diverse Dinosaurian ichnofaunas found to date. Forty-eight discrete Dinosaurian tracksites were identified in this area. Thousands of tracks were examined and measured in situ and using three-dimensional photogrammetry. Tracksites were concentrated in three main areas along the coast: Yanijarri in the north, Walmadany in the middle, especially around James Price Point and Kardilakan–Jajal Buru in the south. The researchers describe the palaeoclimate as a large braided river system within a flood plain that was periodically flooded, located close to the sea. Most of the dinosaur tracks are found in horizons that represent layers generated between the periodic floods. 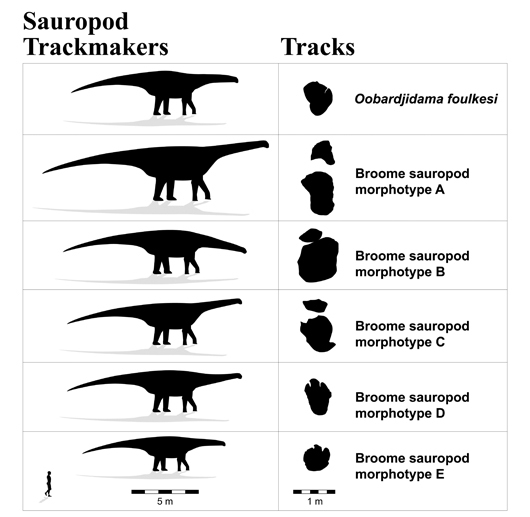 More than six types of Sauropod tracks – including those 1.7 metre long prints left by the giant form. Eleven of these track types could formally be assigned or compared to existing or new ichnotaxa, whereas the remaining ten represent morphotypes that, although distinct, are currently too poorly represented to confidently assign to existing or new ichnotaxa. Prints of a giant Early Cretaceous Ornithopod – Walmadanyichnus. Broome sandstone Theropod track types. The researchers from Queensland University in collaboration with their associates at James Cook University, demonstrate that only two of the ichnotaxa described in this new paper, relate to already described dinosaur species. Tracks assigned to the small Theropod Megalosauropus broomensis and the fleet-footed Ornithopod Wintonopus latomorum have been described before. One new Theropod ichnotaxon – Yangtzepus clarkei (see illustration above). Two new Ornithopod ichnotaxa – Wintonopus middletonae and the eight-metre-long giant Walmadanyichnus hunteri (see photograph of track in this article). One new Sauropod ichnotaxon – Oobardjidama foulkesi (see illustration below). Two new Thyreophoran ichnotaxa – Garbina roeorum and Luluichnus mueckei (see illustration further down this page). The Sauropod biota of the Dampier Peninsula (Early Cretaceous, western Australia). The researchers conclude that the trace fossils preserved on the Dampier Peninsula provide a unique insight into the dinosaur dominated biota of this portion of Gondwanaland in the Early Cretaceous. Both the Sauropods and Ornithopods seem to be diverse and abundant, with the armoured dinosaurs, the only fully quadrupedal bird-hipped dinosaurs recorded. Importantly, the scientists report trackways associated with stegosaurids and overall, a higher density of armoured dinosaurs as well as many different types of Theropod (carnivorous dinosaur), including at least two substantial meat-eaters (Broome Theropod morphotypes B and C), which probably were apex predators. These large carnivores had plenty of prey, the paper, published in the “Journal of Vertebrate Palaeontology” also alludes to large bodied Ornithopods as well as, giant Sauropodomorphs. Note the giant stegosaurid dinosaur, depicted in the illustration above. Some of the stegosaurid prints are around eighty centimetres long and approximately seventy centimetres across. This armoured dinosaur rivals the Broome sandstone Sauropods in terms of size. Assigned to the ichnogenus Garbina, the trackways indicate a truly huge armoured dinosaur. Although Everything Dinosaur team members, having read the scientific paper, cannot find any specific size calculations for this dinosaur, the tracks are considerably bigger than those assigned to the ichnotaxon Garbina roeorum. This stegosaurid, could be one of the largest armoured dinosaurs yet described, with a body length exceeding eleven metres. In many respects, the biota represented by the Broome sandstone tracks suggest a carryover of typical megafauna from the Late Jurassic, a time when the majority of Dinosaurian clades had a more cosmopolitan distribution prior to the break up of the super-continent of Pangaea. Although the fossil record for the Lower Cretaceous of Gondwana is very poor, a similar mix of taxa occurs in the Barremian–lower Aptian La Amarga Formation (Argentina) and the Berriasian–Hauterivian Kirkwood Formation of South Africa. The persistence of this fauna across the Jurassic-Cretaceous boundary in South America, Africa, and Australia might be characteristic of Gondwanan Dinosaurian faunas more broadly. The Dampier Peninsula tracksites suggest that the extinction event that affected dinosaurs in the northern hemisphere across the Jurassic/Cretaceous boundary may not have been as severe further south (Gondwana). The disappearance of stegosaurids from Australia as indicated by the lack of fossils in younger Cretaceous strata and the apparent decline in Theropoda diversity by the mid-Cretaceous indicates that, similar to what may have happened in South America, Australia passed through a period of faunal turnover from 140 mya to around 125 mya. Field worker Louise Middleton and a stegosaurid trackway (Garbina). Note the dog in the picture – Missy. If we briefly side step (no pun intended), the issue as to whether the Sauropodomorpha belong within the Order Dinosauria (see our article posted up on March 23rd, which explains about a potential re-classification of dinosaurs), is one of the Broome sandstone prints the biggest dinosaur footprint yet described? The picture above shows the actual image released by Queensland University to illustrate the potential size of the dinosaur which made the series of prints which measure up to 1.7 metres in length. Assessments of stride length suggest a Sauropod dinosaur with a hip height of around 5.3 to 5.5 metres. The line drawing provides scale, potentially the long-necked dinosaur that made these tracks could have exceeded twenty-five metres in length. There is not enough information at the moment to assign an ichnogenus to this Sauropodamorph, it has been named “Broome Sauropod morphotype A”. Certainly, these 1.7 metre long prints are amongst the biggest yet found. The scientific paper: “The Dinosaurian Ichnofauna of the Lower Cretaceous (Valanginian–Barremian) Broome Sandstone of the Walmadany area (James Price Point), Dampier Peninsula, Western Australia”, by Salisbury, S. W., A. Romilio, M. C. Herne, R. T. Tucker, and J. P. Nair. Published in Journal of Vertebrate Palaeontology. Another busy day for the team members at Everything Dinosaur. Children in the Foundation Stage classes (Nursery and Reception), at Saint Thomas C of E Primary have been learning all about dinosaurs and fossils. Everything Dinosaur was invited into the school to work with the two classes over the course of the morning. This well-appointed school conducts lots of outreach activities with its pupils, the children certainly get the opportunity to experience a wide variety of curriculum related activities. The hall had been set aside for our visit, after all, some fossils can be quite big, or even “massive” as pointed out by a child in Nursery when we looked at the best way to describe fossils. Dinosaurs and fossils in the school hall. The morning assembly was cancelled, this allowed us to have more time working with the Foundation Stage children. The Nursery class went first and they, very enthusiastically, mimicked the survival skills of armoured dinosaurs. The children “froze like statues” when Tyrannosaurus rex came into their forest. Prior to the workshop, we had checked with the teaching team so that we could deliver sessions that supported the scheme of work and learning objectives. We were informed that one pupil loved looking at smooth objects, so we ensured that some polished fossils, including sectioned ammonites were incorporated into the tactile workshops. We are palaeontologists (display area in school). The light, airy and tidy Reception classroom had lots of space for dinosaur themed displays. We especially liked the “cave” in the corner that the dedicated teaching team had created for the budding palaeontologists to practice their phonics and to display their fossil finds. Having been advised that the Reception class were going to be learning about the famous fossil hunter Mary Anning, we made sure to provide some suitable extension resources featuring this pioneering Georgian woman. We also challenged the class to draw their very own dinosaur, could they label the body parts including the skull? This simple exercise is a great way to reinforce learning when it comes to parts of the body and the differences between ourselves and other animals. A “dinosaur hokey cokey” that we had prepared was also handed over, a chance to help the children with their motor skills and to tie in drama and music/movement activities into the dinosaurs and fossils term topic. The first of the new for 2017 Papo dinosaur models are in stock at Everything Dinosaur. We have just received our first shipment of the new Papo Polacanthus dinosaur model, along with new versions of the Papo Oviraptor and the Papo Velociraptor replica. Papo dinosaur models for Spring 2017. The Papo range continues to go from strength to strength and it is great to see a model of the armoured dinosaur Polacanthus included within the Papo product portfolio. The polacanthids are an enigmatic group of dinosaurs, with a lot of fossil material associated with discoveries made in the British Isles. Polacanthus seems to have been quite closely related to Gastonia (G. burgei) from the United States, both these dinosaurs had a plate of armour over their hips (sacral shield). Such a sacral shield can be clearly made out on the new Papo Polacanthus replica. Dinosaur model collectors can have their very own pack of “raptors”, as this new blue painted version of Velociraptor joins the Papo range. The model is the same size as the Papo green Velociraptor that joined the range last year and it too has an articulated lower jaw. This is not a new model, but continues the trend from Papo and other manufacturers to produce re-painted versions of existing models. The original Velociraptor replica, has been retired, but its re-painted version is still going strong. This model was joined by the green painted Velociraptor in 2016. This replica will be retired shortly, the blue Velociraptor (although the models actually look quite purple), will effectively replace it. A trio of Papo Velociraptors. One of the most colourful dinosaur models to be introduced this year is the re-painted version of the Papo Oviraptor. It still lacks feathers, but the new interpretation does at least demonstrate that some dinosaurs may have been keen to stand out from the crowd. That famous skull crest is a bright orange, this contrasts nicely with the metallic blue down the neck and over the back of the head. There is a blue flash that runs from the shoulder, along the flank, over the hips and ends near the tip of the tail. As far as we can make out, even the egg that “egg thief” is carrying has been given a makeover. The eggs in our batch of models seem to be a little darker than those found with the original Papo Oviraptor model. One thing is for sure, Papo’s own unique designs shine through and we look forward to receiving the next set of new for 2017 models shortly. One of the most significant steps (no pun intended), in vertebrate evolution took place some 385 million-years-ago when some types of sarcopterygian fish evolved rudimentary limbs and started to clamber around on land. These fish were the ancestors of all the Tetrapods (four-legged vertebrates), amphibians, reptiles, birds, mammals and of course ourselves. It could be argued that our species, Homo sapiens, is nothing more than a highly modified fish! How and why the transition from living in a watery world to one of a terrestrial lifestyle took place is hotly debated by palaeontologists. One team of researchers from the Northwestern University (Illinois), in collaboration with colleagues from the Natural History Museum of Los Angeles County and optical imaging specialists, have come up with a remarkable theory that explains the move from the water to the land. Meet our next of fin, check out the location of the eyes (top of the head). Improvement in eyesight was the driver for the momentous leap from water onto land and not limb evolution linked to a better ability to clamber about on terra firma. The scientists which included corresponding authors Malcolm MacIver and Lars Schmitz (Northwestern University), spent a year running simulations comparing many different types of fossil. The researchers noticed that there was a dramatic increase in fish eye size, the eyes tripled in size and they shifted from the sides of the head to the top of the skull. These adaptations took place long before the first modified fins looking like limbs evolved. The team speculate that before permanent life on land came about, certain types of fish became ambush predators, hunting terrestrial invertebrates using similar tactics to modern-day crocodiles. Eyes near the top of the head would have allowed these creatures to observe the land without giving themselves away. They could spot potential prey on the land. Being able to spot potential food provided a distinct advantage and as light travels better in air than it does in water, these fish could see a lot further. Natural selection led to the evolution of bigger eyes and better eyesight. The “buena vista” (good view) hypothesis that the study proposes states that being able to see food opportunities far away provided a stimulus to drive the evolution of locomotion to reach the potential prey. This aided the natural selection for improved, stronger limbs, first for brief forays onto land to ambush prey and later for a life in a terrestrial environment. Hunting on land was a mental game changer for the early Tetrapods and we applaud the team behind the research who have collaborated with animators to produce a very helpful explanatory video. The video written and produced by Kristin Pichaske with the collaboration of Malcolm MacIver is provided here and it is great to see research summarised in such a way so as to make it much more accessible. Our congratulations to everyone involved in the study and also to the team behind this most informative video. Official Chinese State media has reported the arrest of a man accused of stealing dozens of fossilised dinosaur eggs. A number of specimens have been recovered but many more are, as yet, unaccounted for. China has some of the strictest regulations and laws in the world, when it comes to protecting rare artefacts including fossil remains. Sadly, despite the very best efforts of the authorities there is a thriving black market in illegally acquired fossils, with huge sums of money being exchanged for dinosaur fossils including teeth, bones and fossilised eggs. A dinosaur egg (believed to be from a Theropod dinosaur). The media report states that a Chinese citizen with the surname Wang has been accused of stealing eighty dinosaur eggs from a collector in Zhejiang Province on the night of January 9th 2017. Three other accomplices are believed to have been involved according to the report from the Xinhua News Agency. Mr Wang had previously visited the collector twice under the pretext of making a prospective purchase, agency sources have stated. The four suspects are believed to have divided up the stolen property and Mr Wang took home a total of twenty-seven eggs. Police raided Mr Wang’s home earlier this month after arresting him, during the search of the property in Huanan County (Heilongjiang Province), the authorities were able to recover the stolen eggs, the remaining fossils, an estimated fifty or so specimens, have yet to be recovered. Protoceratops fossil display in Frankfurt Museum (could be a cast). The three accomplices have also been apprehended, Heilongjiang police have confirmed that Mr Wang was in police custody but no further information about the other parties involved was provided. Over the last five decades or so, as China’s geology has been explored in more detail, a treasure trove of fossil material has been discovered, including numerous dinosaur fossils. The Institute of Vertebrate Palaeontology and Palaeoanthropology (IVPP) in Beijing is believed to hold the world’s largest collection of vertebrate fossils. Sadly, despite it being illegal to export fossils and other material out of China, thefts still occur and many important fossils have been sent overseas to end up in the hands of private collectors. Fossil protection legislation in the People’s Republic of China is comprehensive, the illegal excavation and export of vertebrate fossils including eggs was covered in the 1982 Cultural Relics Protection Law. This law was developed from existing rules and regulations that had been in place prior to the Cultural Revolution. More recently, legislation in this area was reviewed (2010-2013) and a number of Chinese scientific institutions have published guidelines and procedures to help organisations that are based outside China to stay on the right side of the law. An Oviraptor dinosaur sitting on a nest of fossilised eggs. All too often Everything Dinosaur has had to report on this blog incidences of fossil theft, illegal excavations or deliberate vandalism to an important fossil site. The Estuarine crocodile that fatally attacked a spear fisherman in the far north of Queensland (Australia) has been caught and killed according to local officials. Warren Hughes (35), was attacked at Palmer Point, near Innisfail, south of Cairns last Saturday. His empty dinghy and spearfishing tackle was found on Saturday evening, but his body was not discovered until the following Monday. In a statement released by the Department of Environment and Heritage Protection (EHP), the four-metre long reptile was captured on the evening of the 21st March (Tuesday), at the mouth of the Russell River, not far from the scene of the attack. Environment Minister Steven Miles commented that the wildlife officers were confident this crocodile was the animal responsible due to its size and the fact that it was found in close proximity to where the attack took place. “CrocWise” is a Northern Territory Government campaign to educate people about crocodiles and reduce the risk of attacks. As the Saltwater (Estuarine) crocodile population has grown over the last fifty years or so, there has been an increase in crocodile attacks on swimmers and fisherman. With Australian urban centres expanding further into, what was once wilderness, so there is an ever-increasing threat from encounters with these apex, highly dangerous predators. Sadly, many people still don’t understand the threat that these crocodiles, some of which can grow to over six metres long, can pose. On Saturday 18th March, a teenager, Lee de Paauw was badly mauled by a three to four-metre-long crocodile after jumping into a river, known to have a resident population of crocodiles, north of Queensland. It seems the 18-year-old embarked on his foolish dip after being dared to do it by his friends. Luckily, the young man managed to escape the attentions of the predator, however, he received severe injuries to his left arm. This morning, (24th March), wildlife rangers trapped a large crocodile very close to where Lee was mauled. The animal is being kept at a holding facility until it can be properly located. The Australian Government has a capture and release programme in place to deal with dangerous crocodiles. It is hoped that this particular crocodile will be relocated to an Australian zoo. The crocodile believed to be responsible for the attack on a teenager. So, the scientific paper is out, published in the journal Nature and with the snappy title “A New Hypothesis of Dinosaur Relationships and Early Dinosaur Evolution”. Just about everything that we thought we knew about when, where and how the dinosaurs evolved has been turned on its head. In addition, the dinosaur family tree has been re-drawn, all the text books written about these iconic prehistoric animals published since 1887, basically got it wrong! It’s a big story, it dwarfs Argentinosaurus! So, let’s take a step back and examine what exactly does this new paper mean. Theropods like T. rex re-assigned and united with the bird-hipped dinosaurs in this new model. The clades that make up the Order Dinosauria, need to be rearranged. Theropod dinosaurs which are closely related to modern birds, previously classified as Saurischian dinosaurs (lizard-hipped), need to be grouped with the bird-hipped forms in a new clade proposed as the Ornithoscelida. Bird-hipped dinosaurs (Ornithischia) clade now directly associated with the evolution of birds. Lizard-hipped Sauropodomorpha, the clade that includes Diplodocus, Plateosaurus and Argentinosaurus et al would now fall outside the Order Dinosauria. The definition of what a dinosaur is (Dinosauria) would have to be changed to allow the Sauropodomorpha back in. The first dinosaurs may not have evolved in the southern hemisphere (South America or southern Africa – Gondwana), but they may have evolved further north on the landmass called Laurasia. Under this new redrawing of the dinosaur family tree, some of the Dinosauriforms (ancestors of the Dinosauria), such as Saltopus (fossils from Scotland) and the controversial Agnosphitys (fossils from Avon), provide evidence to support the idea that some of the very first dinosaurs may have evolved in the area we now know as the UK. The first types of dinosaur may have been omnivores and not carnivores as generally accepted. With this re-definition of dinosaur evolution, the first dinosaurs evolved some 247 million years ago, pushing the origins of the Dinosauria back some 15 million years. Simplified diagram comparing traditional view of the dinosaur family tree with the new model. The picture above shows (top) the traditional view of the dinosaur family tree as proposed by Henry Govier Seeley in a paper entitled “On the Classification of the Fossil Animals Commonly Named Dinosauria” published in the Proceedings of the Royal Society (London) back in 1887. This has been the accepted, conventional interpretation for the last 130 years or so. The new model is depicted (bottom), this interpretation reflects in part, the dinosaur family proposed by Thomas Huxley in a paper published in 1870, entitled “On the Classification of the Dinosauria with Observations on the Dinosauria of the Trias” in the quarterly journal of the Geological Society. Back in 1870, Huxley looked at compsognathids, iguanodontids, Megalosaurs and the primitive armoured dinosaur Scelidosaurus and found enough common characteristics amongst these different types of dinosaur to unite them into a single clade, which he called the Ornithoscelida (orn-nith-oh-skel-lie-dah). The research team, writing in the academic journal “Nature” had many thousands more fossils to study than either Huxley or Seeley, they conclude that Huxley’s interpretation has more validity than the conventional view that gives precedence to Seeley’s interpretation. Baron et al suggest that the term Ornithoscelida be resurrected to apply to Ornithischians and the Theropoda. Everything Dinosaur’s comparison of the two family trees shows something else. The green lines lead to those groups of dinosaurs that were predominantly herbivorous, whilst the red lines lead to dinosaur types that comprise mainly carnivores. In the new model, the Sauropodomorpha, dinosaurs like Diplodocus and their kind are placed outside the new definition of the Dinosauria. The herrerasaurids (Herrerasauridae), with their confusing array of dinosaur and non-dinosaur traits, are also placed outside the new strict definition of what dinosaurs are. Dinosaurs like Herrerasaurus are not classified as Theropods in this new model, which means that meat-eating in dinosaurs evolved twice, once in the herrerasaurids and once in the Theropoda. At Everything Dinosaur, we define science as “the search for truth”. The authors of this new paper, graduate student Matthew Baron, Dr David Norman (Cambridge University) and Professor Paul Barrett (London Natural History Museum), reviewed a total of seventy-four different types of dinosaur and looked at their common traits and characteristics. They started with a blank sheet of paper, bravely set aside conventional thinking and tried to find the best fit for the scientific evidence. The researchers carefully studied thousands of fossil bones and mapped 457 anatomical characteristics across the 74 different types of dinosaur. This meticulous study led them to re-draw the cladogram that represents the dinosaur family tree. The phylogenetic relationships between early dinosaurs. The diagram above show the newly proposed phylogenetic relationship plotted against geological time for the early dinosaurs and their close relatives (Dinosauriformes). A = the least inclusive grouping (clade) that includes the House Sparrow, Triceratops and Diplodocus. B = the least inclusive grouping (clade) that includes the House Sparrow and Triceratops (the Ornithoscelida). C = the most inclusive clade that contains Diplodocus but not Triceratops – (the new definition of the Saurischia). This is a fascinating and intriguing insight into the phylogenetic relationships of the Dinosauria and their closest relatives. However, numerous studies have been conducted in the past and Henry Govier Seeley’s analysis has held sway. Some of the conclusions drawn are likely to be challenged by other palaeontologists and the debate as to the cladistic relationships and the implications for how, when and where the dinosaurs evolved is going to continue. Take for example, the idea that the dinosaurs may have evolved further north than previously thought. The fossils from Scotland and the west country of England (Avon) are highly fragmentary and far from complete. Indeed, much of the Triassic material ascribed to early types of dinosaur or their near relatives, the Silesauridae, is very piecemeal. Many more fossils need to be found before a clearer picture as to the origins of the Dinosauria can be established. Back in April 27th 2015, Everything Dinosaur published a blog article all about the discovery of a bizarre new Theropod dinosaur named Chilesaurus (C. diegosuarezi). Although it was classified as a member of the lizard-hipped Theropoda, a group that were predominately meat-eaters, this Late Jurassic, South American dinosaur took a very different evolutionary path – it seems to have become a herbivore. Chilesaurus, shows anatomical characteristics quite unlike any other Theropod dinosaur. Not least, the pubis bone is projecting backwards, which is similar in orientation to the layout of the pelvic girdles of Ornithischian (bird-hipped) dinosaurs. Our article about this very curious dinosaur required us to use an annotated diagram that showed the differences in the hip bones of the Saurischia (lizard-hipped) and the Ornithischia (bird-hipped) dinosaurs. We are honoured that this same illustration was used by the BBC in the coverage of this new scientific paper. The scientific paper: “A New Hypothesis of Dinosaur Relationships and Early Dinosaur Evolution” M. Baron et al published in the journal Nature. Sir David Attenborough has been honoured by an international team of scientists who have named a newly described Silurian Arthropod after the veteran broadcaster and naturalist. Sir David has had a number of new species named in his honour, this 430 million-year-old, distant relative of today’s crabs and lobsters joins a long list of flora and fauna that includes wild flowers and a Jurassic Pliosaur (Attenborosaurus conybeari). A computer generated image of the newly described Silurian Arthropod Cascolus ravitis. Sir David grew up in Leicestershire, he and his family lived on the campus of the former University College Leicester, where his father was the principal. As a boy, Sir David often explored the exposed Jurassic outcrops, near to his Leicester home hunting for fossils. His love of the local countryside and the animals and plants that surrounded his home, fuelled his passion to become a scientist. The fossil specimen, which measures less than ten millimetres long, is described as “exceptionally well-preserved in three-dimensions”. The researchers, which include scientists from Imperial College (London), Oxford University and Yale (United States), as well as Leicester University, have been able to identify the exoskeleton and other parts of the animal, such as the delicate antennae, legs and the compound eyes. It has been assigned to the Crustacea sub-phylum and joins a remarkable fossil assemblage representing a marine biota preserved when ash from a volcano covered an ancient underwater ecosystem. The actual location of the fossil site is a closely guarded secret, the site can be found in the county of Herefordshire, close to the Welsh border. At this location, the limestone rock sequence is interrupted by a fine-grained bedding plane that represents ash from a volcanic eruption that smothered the seabed. The ash buried all the creatures in and around the seafloor at the time, creating a unique opportunity for palaeontologists to study this ancient habitat. The genus name is derived from “castrum” meaning stronghold and “colus” which translates from the Old English as “dwelling in”, terms from which the surname Attenborough is derived. The species name is a combination of “Ratae”, the Roman name for Leicester, “vita” which means life and “commeatis” a messenger. Sir David Attenborough receiving a high-resolution image of the newly described Silurian fossil. Left to right: Derek Siveter, (University of Oxford), Sir David Attenborough, Professor Paul Boyle, President and Vice-Chancellor of University of Leicester and David Siveter, University of Leicester. Everything Dinosaur acknowledges the help of a press release from Leicester University in the compilation of this article. The research is published in the journal Proceedings of the Royal Society B (Biology).